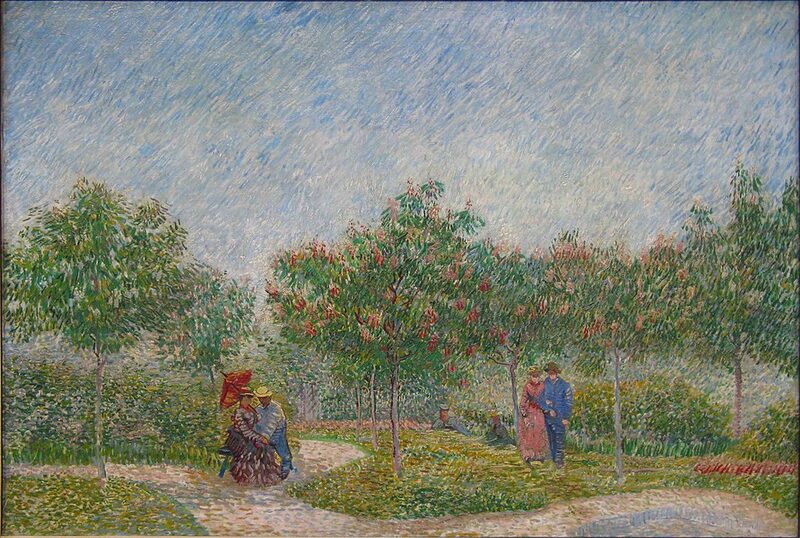 In the spring of 1887 van Gogh met Paul Signac frequently to paint in and around Asnières and his output at this time was unmistakably influenced by Signac. Here van Gogh experiments with neo-impressionist ideas but always retains his own vision and individuality. His points or strokes of colour are not as precise as Signac’s – in this painting we can see that Vincent uses rather long divisionist dashes, particularly in the shimmering sky, varying the shape and texture of his brush strokes to create texture, resulting in a scintillating surface. Van Gogh was always more interested in intuition than dogma and analysis, but it is undeniable that it was Signac’s example which persuaded him to use more varied (in this case divisionist) brushwork. Two couples walk in a suburban park beneath that seething sky. The flowering trees look as though they have been recently planted which places the park as a relatively new amenity like much of the environs of Asnières. The men escorting their ladies along the gravel paths are clad in blue, identifying them as manual workers of some kind and this also provides a clue to the make up of the locality – a fast growing semi-industrial suburb which attracted a number of artists of the impressionist and neo-impressionist circle – perhaps as a way of balancing the plethora of recent paintings depicting the bourgeois grand boulevards.